Smokey Sun above the Olympics August 11, 2014. 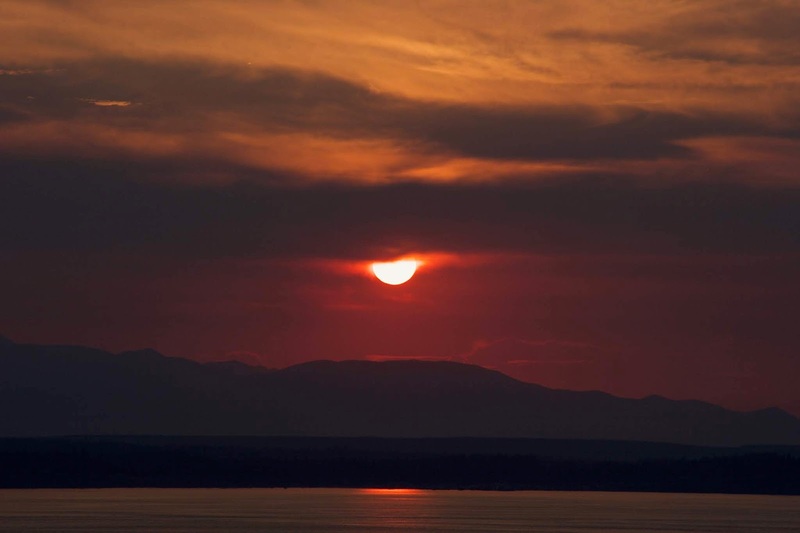 The heat and smokey skies are expected to return in the middle of the week. This heat wave should be short-lived compared to our last one. Sunny skies and clear nights are expected most of the week. Monday-Tuesday highs are expected to be in the low to mid 80's. Wednesday - Thursday highs are expected to be in the mid 80's to near 90°F, with areas of smoke. We start cooling down on Friday, with highs making it to the low-mid 80's. Friday evening some moisture approaches with cooling temperatures and possible showers. Next weekend looks pleasant with morning clouds and possible showers or drizzle, clearing to sunny skies and highs in the 70's. July was indeed warmer and drier than normal for Shoreline and Lake Forest Park. We had about half the normal rainfall, but for July this is pretty variable anyway given we typically dry up for the summer. Most precipitation comes from either morning drizzle or the rare thunderstorm. 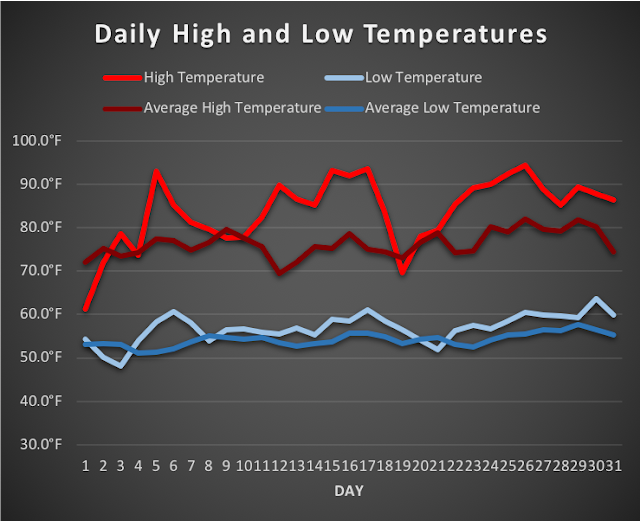 Our average temperature for the month of July was 68.3°F, the station's overall average is 63.5°F so we were nearly 5°F above normal. Below are the high and low temperatures graphed for the month compared to the average.